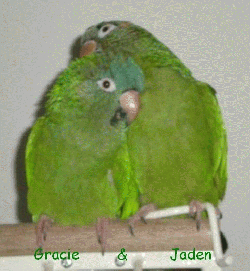 Jaden was a previous Mickaboo bird who was adopted to be a friend for Gracie, and they quickly became bonded buddies. But, when their mom could not keep them they came back to Mickaboo to find a new forever home. Jaden and Gracie are currently enjoying and entertaining their foster parents with typical blue-crown charm and playfulness. They are starting to learn basic clicker training and working on reducing their tendency to nip when scared. They have good appetites and are starting to learn foraging. Gracie makes cute little kisses sounds and both of them occasionally talk a little. These sweet birdies just love hanging out with the family, watching TV, playing with their toys, or mutally grooming. They are conures, and so love to vocalize, but for conures, they are relatively quiet. If you`d like to brighten your home with this cute little pair, contact the conure coordinator!